They train like Olympians. Every day is a training day. Rest is just as important as days filled with activity. Olympic athletes have a plan, stick to the plan, and know that each day they’re getting closer to their ultimate goal. Are you making strides to your ultimate career goal? Do you have a plan to support it? They set the bar high. Watching events like the high-jump made me realize that each athlete’s goal wasn’t just to make it to the summer games. The goal was to win and to win with honor. And you know what? Setting the bar high isn’t enough. After the athlete cleared the bar, they set it even higher! Are you adjusting your career goals in this manner? Aim for the stars! They have the right people on their teams. From their athletic coaches to friends, from parents to their healthy competition, Olympians build the right team for them. Why? Training isn’t just physical. It can also be emotional, mental and spiritual. Having the right support in each area can make a person quite the force to be reckoned with! Are you building your own Dream Team in life? 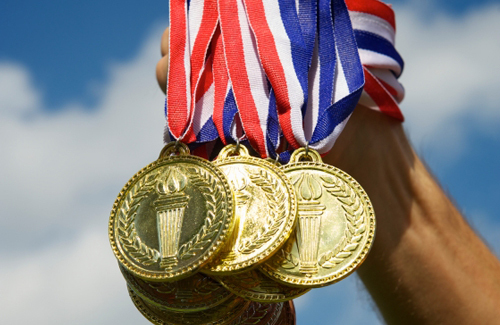 What was your favorite summer Olympic sport? What other career lessons can you glean from the games? My favorite sports were Track & Field. I’m currently training for my own marathon on November 4, so the women’s and men’s Olympic marathon was amazing to watch. Other events that had me fascinated this summer were swimming, water polo (wow – what a sport) and gymnastics. It was so cool to watch so many people’s dreams become a reality. Congratulations to all who participated. It was amazing to see so many nations come together. Each athlete trained hard and they were definitely an inspiration to me! I’m serious about my two questions above. I’d love to hear from you. Reply below in the comments or tweet @kbaumann. As always, thanks for reading. Have a great week!